The murder of a Turkish landlord by a Syrian tenant triggered riots in the southeastern province of Gaziantep. At least 10 Syrians were injured and many cars with Syrian license plates were destroyed in the past two days. Hıdır Çalar, 62, engaged in a brawl with his tenants, a Syrian family, when they rejected his order to leave the house, reportedly after the Syrians did not pay the rent. A Syrian suspect stabbed Çalar to death. Upon hearing of the murder, locals attempted to lynch Syrians in the neighborhood. Riot police intervened and dispersed the group trying to storm the house where the murder suspect's family resided. The crowd demanded the handover of the suspect who currently remains at large and argued with the police. Riot police fired teargas and water cannons to disperse the angry crowd. Police officers escorted the Syrians out of the building where the murder took place, while enraged locals pelted police vehicles with stones. 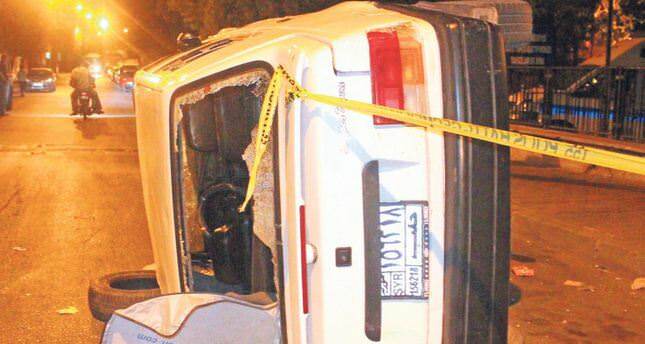 Three policemen were injured in the incidents on Monday night. The family of the murder suspect was accommodated at a state-run guesthouse. A funeral was held for the victim on Tuesday, but the anger did not cease. A group of angry locals attacked shops run by Syrians and beat up two Syrian nationals. The police dispersed the crowd. Hours later, angry crowds converged again in different neighborhoods of Gaziantep. Dozens of cars bearing Syrian license plates were destroyed or trashed by the mob wielding stones and sticks. Syrians passing by could not escape the fury of the group. At least 10 Syrians were reportedly hospitalized after locals attacked them with knives. The police detained an unknown number of rioters, and reinforcements were deployed on several streets against a repeat of riots. Gaziantep police said four Syrians were arrested in connection with the murder, and two other suspects were wanted. Tensions are high in Gaziantep and other Turkish provinces located on the Turkish-Syrian border that hosts a large number of displaced Syrians. The slightest rumor about Syrians being involved in criminal acts sparks anti-Syrian riots in those provinces due to the ubiquity of Syrians in businesses much to the chagrin of unemployed Turks, rising housing prices linked to the flow of Syrians and other related factors. The Gaziantep governorate had called upon locals not to heed social media campaigns last month after groups the governorate described as "provocateurs" invited locals to attend rallies entitled "We don't want Syrians in Gaziantep."